N. Carolina- Business was booming at the Smithfield Meat Processing facility. In fact, business was so good that Smithfield Foods needed to expand their production capacity. 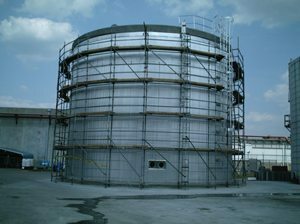 To enable this planned expansion, Smithfield planned to install a large (320,000 gallon) water tank. First things first, however; the water tank pre-construction subgrade had to be densified before the construction of the tank structure. 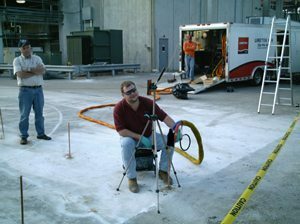 After tests revealed the top six feet of soil only withstood single blow counts with a penetrometer, it was quickly determined that extensive soil densification was imperative to assure structural stability of the water tank. Additional fact-finding further revealed that a reinforced concrete pipe (“RCP”) drain line crossed the proposed tank location; this led to concerns that if the soil was not densified properly, any subgrade tank settlement would cause irreparable damage to this line. A geotechnical firm recommended a deep pile foundation as the first option and a mat foundation as the second option. With the mat foundation option, assumed maximum settlement at the center of the mat foundation was +/- 0′-2 ½”. Smithfield Foods contacted URETEK ICR Mid-Atlantic about possible remediation options. URETEK ICR Mid-Atlantic evaluated the data and proposed URETEK’s Deep Injection® Process. The Deep Injection® Process is a technologically advanced process that uses structural grade polymer injected through probes at depth into the soil, in order to effectively improve load bearing capacity of the sub-grade. 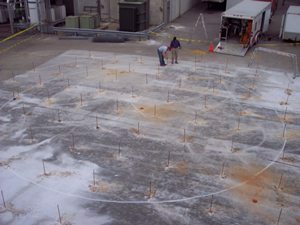 A grid pattern (left) was used for densification of the tank foundation site and along the RCP to seal the joints and stabilize the pipe. URETEK suggested that a better densification result could be obtained if the DI process was completed under the tank loads. Drilling holes through the floor of the completed tank was not an option, so pre-loading the construction slab was explored. The total loads of the completed tank and water on the construction slab were calculated to be around 2,200 pounds per square foot. This loading was too heavy to simulate efficiently, so a joint decision was reached to simulate about half of the total anticipated load per square foot. Eight 330 gallon totes that are used to store and transport the URETEK polymers were filled with concrete and placed around each injection location providing approximately 2,800 lbs. pounds per tote. As the injection was performed (right), the surface was monitored for movement. When movement was detected the injection was stopped and the totes were moved to the next location and the process was repeated. After the entire site was densified using this method, the site was turned back over to the owner for the tank construction. Eight months after the completion of the project, the tank is in daily use with very minor settlement (-0.02′) in the foundation.